I was born in Cracow, Poland, the youngest of four children--two sisters and a brother. Poland was very rough on all minorities, especially Jews. We lived in a 'ghetto,' where we were restricted to a very small section from where you wandered to other places at considerable risk. We were very poor financially. My father went AWOL from the army and came to New York. My early childhood was reasonably normal. At the age of three my mother took me (by force, I must admit) to 'cheder,' a Hebrew kindergarten. It was useless to object and scream. When it came to education she was without pity for my discomfort. It soon became obvious that I could obtain many favors if my Hebrew school lessons progressed impressively, and I really excelled in my studies. This of course made me her favorite and she harbored a belief that I would become a rabbi. I continued my Hebrew studies in a Yeshiva and advanced in Hebrew school. There were some Jews who lived and worked outside the ghetto. Cracow was a beautiful city, and for the doctors, lawyers, scientists and businessmen life was easy and enjoyable. The city boasted of its many museums, parks, universities and theatres. They were, however, restricted to the affluent. The poor Jews witnessed the pogroms that were frequent and deadly. The Polish population was always ready to blame the Jews for all their problems. The desecration of synagogues was always excused. No one was ever punished or even questioned. There were many houses of worship in the ghetto, three on one block. Most of them were Orthodox, a few Conservative and one Reform. The Reform temple was where non-Jewish women were part of the choir (the singing group that assisted the cantor.) Of course, we were not allowed to visit or even to stop and listen. We treated that synagogue as we did the Christian churches. As I understand from later stories, our family (before my father's exodus) was successful financially. Dad and Mom ran a tailor shop. My brother was cared for by a young woman who was learning the trade. Her duties included all the household chores including the care of the children. Conditions changed when my father left for the United States. Mother was forced to close the tailor shop and had to find work at another shop. The pay was barely enough for minimal existence. On many days our meals consisted of cereal, potatoes or rice dishes. It must be said that Jewish women made meals from nothing. No wonder they make such good cooks. They certainly learned to improvise. My father, after living nine years in the United States with his sister and her family, saved enough money to send for my oldest sister and brother. There were two reasons for his choosing my brother and sister. One reason was that he had little money. Second, they were old enough to work. They both found work immediately. They all lived in one apartment, about twelve people. Approximately three years after my brother and sister came to the United States, my mother received the good news that the three of us were finally going to the 'promised land.' We became instant celebrities. All of our friends and neighbors envied our good fortune. We were going to America where the streets were strewn with gold and everybody lived in mansions with private baths in each room, there was a good job for every person willing to work, and abundant food for every table. We knew better, but we were certainly were not going to set them straight. We were enjoying the attention too much. Pictured in photograph shown above (lt. to rt. 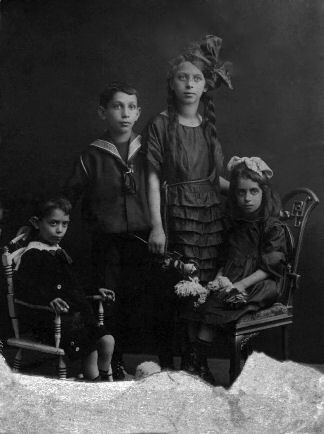 ): Jacob, Abraham, Rose and Sylvia Messinger, c. 1920-1.